Navaratri days are meant for worshipping feminine form of supreme power to achieve spiritual upliftment OR fulfillment of material wishes in life. The word Nav indicates the number nine. This number is a perfect or purna number, after which there is no number. 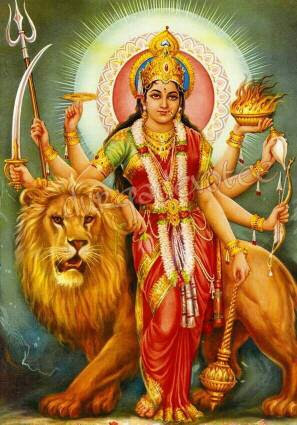 There are nine forms of Shakti or Goddesses that rule the universe, known as Nav Durga. The second part of the word Navaratri is ratri or night, that time of the daily cycle when humans go to sleep, to get rest from the fatigue resulting from the physical or mental efforts put in during the day and to charge up the body and mind for the next day’s activities. Thus, Navaratri is a great time for performing puja, sadhana or aaradhana of Maa Durga to purify our mind and rejuvenate our soul, which get tired with the worldly affairs. The word Durga symbolises Durg in the Sanskrit language. Durg means – fort. A fort is built in such a way that it is not easily accessible for outer opposite forces and protects who are inside . Similarly, worshipping Durga creates a fort-like environment for the worshipper by strengthening devotee’s body, mind and soul. Prathamam Shailputri, Dwitiyam Brahamcharini, Tratiyam Chandraghanteti, Kushmandeti chaturthakam ! Pancham Skandmateti , Shashtham Kaatyayni ch, saptam Kaalratri, mahagauri ch ashtamam !! Navam Siddhidatri ch Navdurga prakeertitah !!! Whenever, on earth the season changes, Supreme form of ENERGY get’s available in plenty of amount and can also be easily access. In the same way human body also gets prepared to receive the energy on the same time. At this time following discipline can make the body absorb the energy in plenty amount which can be use to uplift the spiritual level by balancing mind and body in better way than rest of the days. Navratri’s Nine days sequence is the representation of a seeker’s stages on path of Self Realization. Navratri’s first three days balance the tamo gun, next three days balances the rajo gun, and the last three days increases the sato gun. Tamo guna is balanced by Mata Duga / Kaali, Rajo gun’s devi is Mata Laxmi and Sato guna is represented by mata Saraswati. First you resolve your tamo guna by removing your hidden negative tendencies and desires. This need lot of discipline, hard work, patience and faith, as cleaning of self is not an easy task . After PURIFICATION balancing of the the rajo guna starts by Goddess Mahalaxmi in form of development of positive qualities like dedication, surrender, power to work hard etc etc. Than after lot of practice a time comes when we are ready to receive KNOWLEDGE OF SELF by establishing self in sato guna, depicted in the form of Goddess Saraswati. When this happens Seeker merges with theSupreme and DUALITY as well as cycle of birth ends here.